Looks like the Rams and the Patriots are headed to the Super Bowl in a couple weeks, but personally I was rooting for the Houston Texans to win it all. 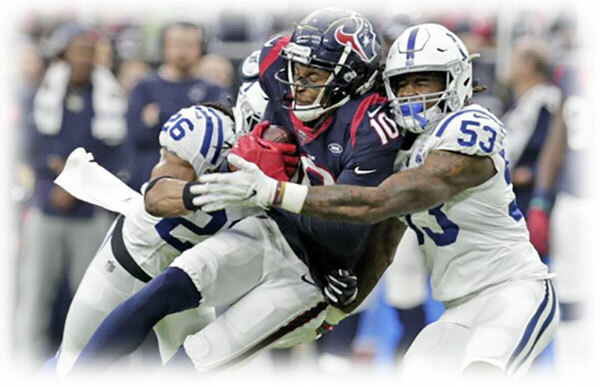 One of the shocking aspects of the Houston Texans’ loss to the Colts in the semifinals was the Grade 3 acromioclavicular (AC joint) injury suffered by DeAndre Hopkins. Arguably the best receiver in football, this Pro-bowler just wasn’t the same playing with that damaged shoulder. So, I’m blaming the Texans’ loss on his AC injury. Although a Grade 3 is considered a serious ligament sprain, many of my competitive athletes experience milder AC joint fixations that can be helped with Myoskeletal Techniques. Here’s a fly-by on treating this “can’t get no respect” joint. The AC joint sits on the point of the shoulder lateral to the sternoclavicular (SC) and proximal to the glenohumeral (GH) joint. Regrettably, this oft-overlooked bony articulation receives little respect from most manual therapists. Both the AC and SC joints play vital roles in the biomechanics of throwing and other upper-limb activities. 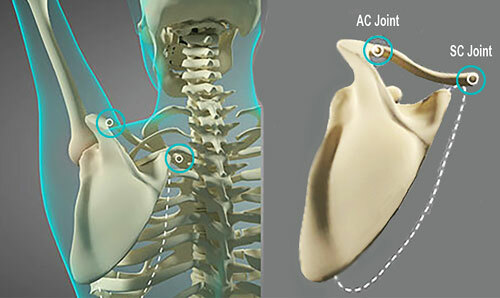 AC joint impairment typically results from falling directly on the point of the shoulder or — as in DeAndre Hopkins’ case — a direct clash of shoulders between players. Because the AC is such a small joint, some believe that the human shoulder girdle could function adequately without it… I disagree. As we will see, long-term AC restrictions can have devastating affects on all upper limb functioning. The AC is a planar joint allowing small movements in all three cardinal planes (sagittal, horizontal and frontal). 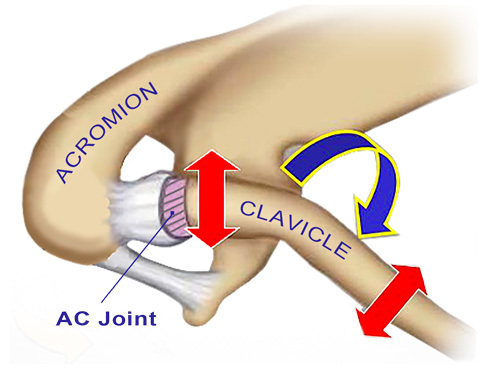 For example, arm abduction in the frontal plane causes the acromion to glide superiorly on the distal clavicle (Fig 2). Test this motion on yourself by sliding your right index finger laterally along the superior surface of your left clavicle beginning at the SC joint. Just before you contact the acromion, you will palpate a bump or a notch. During arm elevation, you should feel the acromion rise in relationship to the clavicle, i.e., left arm abduction should create a palpable “dip” between these two bony articulations. We’ll now address the three most common AC joint restrictions — internal and external rotation—and abduction (Figure 3). To test for internal and external rotational fixations, it’s important that the client’s elbow is flexed 90° — arm horizontally abducted 90° —and horizontally adducted 30°. Note: Horizontally adducting the arm 30° is critical during this assessment since it close-packs the glenohumeral joint allowing the therapist to isolate AC movement. Since AC joint restrictions typically limit end-range elevation and cross-body adduction; they are commonly seen in long-standing rotator cuff and frozen shoulder dysfunctions. In my practice, I’ve found that sternoclavicular and acromioclavicular joint movements are typically altered in those suffering traumatic shoulder injuries and/or chronic suboptimal posture. Slumped posture often starts as a “tissue issue” due to tension, trauma, or overuse. However, it eventually manifests as a sign of functional weakness in the brain’s hardware. This weakness stems from faulty peripheral input, inaccurate cortical processing, flawed output, or a combination of these factors. Extremity joints set off mechanoreceptive muscle/joint reflex arcs that can travel up and down the kinetic chain producing reactive muscle guarding (splinting) in neighboring structures. Pain-spasm-pain cycles are often hard to break until full range of motion is restored to these commonly overlooked shoulder girdle articulations. Try these simple graded exposure stretches to improve your thoracic outlet and rotator cuff clients and to enhance performance in your competitive athletes like DeAndre Hopkins.